For an optimal 3D audio experience on headphones, you can customize the Waves Nx apps (Windows/Mac and mobile) to your personal head measurements, following these steps. 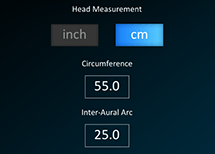 Nx factors your precise head dimensions and the distance between your ears in order to calculate the inter-aural delays (ITD) and the filters and gains (ILD) for each ear. 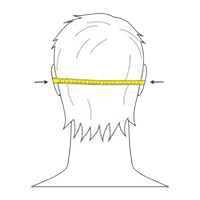 These are used to approximate your individual Head-Related Transfer Function (HRTF). The default settings of the Nx app are based on average data for the adult human population, but for optimal experience you can adjust them to your personal dimensions. 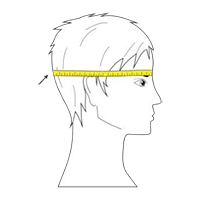 Using an ordinary measuring tape, measure the full circumference of your head over the back of the head, ears and eyebrows. Enter your measurement in the Head Circumference box (notice the units, cm/inch). Then measure the semi-circumference from ear to ear (at the ear canal entrance) over the back of the head. 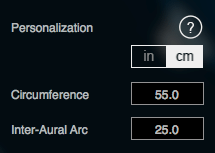 Enter your measurement in the Inter-Aural Arc box (notice the units, cm/inch).